His father was the musician Vincenzo Galilei. Galileo Galilei's mistress Marina Gamba (1570 â€“ 21 August 1612?) bore him two daughters, (Maria Celeste (Virginia, 1600â€“1634) and Livia (1601â€“1659), both of whom became nuns), and a son, Vincenzo (1606â€“1649), a lutenist. 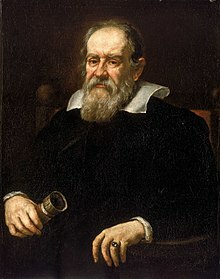 Galileo Galilei (Italian pronunciation: [É¡aliËˆlÉ›Ëo É¡aliËˆlÉ›i]; 15 February 1564 â€“ 8 January 1642) was an Italian polymath: astronomer, physicist, engineer, philosopher, and mathematician, he played a major role in the scientific revolution of the seventeenth century. He has been called the "father of observational astronomy", the "father of modern physics", the "father of scientific method", and the "father of science".